The location was in a Downtown Washington DC Hotel. The "Take It!" came out of looking at this table on a regular basis for a long time. 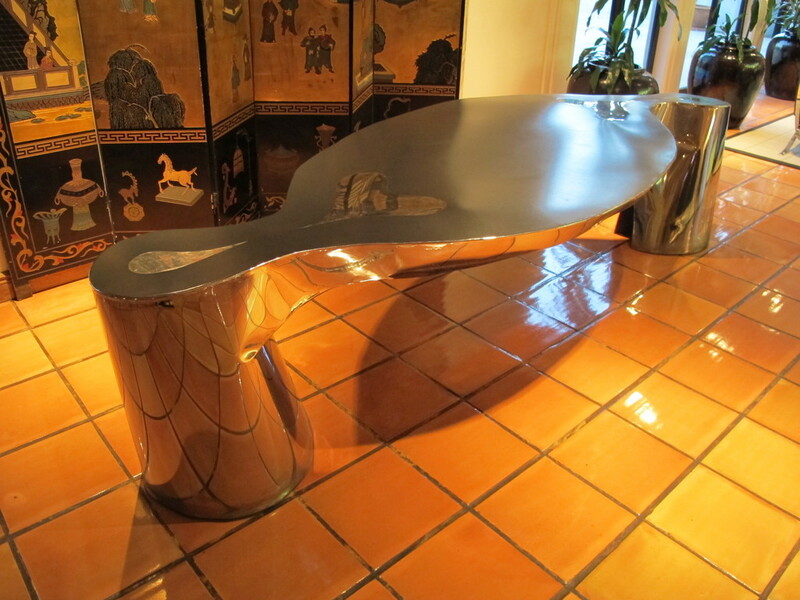 It is a show piece of art work that I wonder if anyone ever used it as an actual table and dined on it. If it was used for dining I think it could actually only seat 4 people without using the ends. I think if anyone were placed at the ends they would feel somehow removed from the flow of conversation because of the geography of the table design. A part of four is ideal. The gleam of the finish is extraordinary. The inset hearts are a touch that adds to the overall set of questions that begs for the designer to share what his thinking was when forming the piece. The After Take: Some weeks after taking this set of pictures, I spoke to a front desk person about it and was told that it had been designed by the architect that had designed the hotel itself. I think it is great when an artist has several mediums they can express themselves in and take the time to do it. He also told me that the Smithsonian was very interested in buying the piece. I hope the hotel never lets it go for it is as distinctively cool as the outside of the building is. Here is hoping you are fortunate enough to have some cool stuff that you can visit on a frequent basis. Even if one does not have the creative touch themselves, an appreciation for it is just as important and brings about wonderful long playing satisfactions. Thanks for joining us for the current photo presentation. You are cordially invited to return Friday, July 13th for a new picture that we hope you will enjoy. 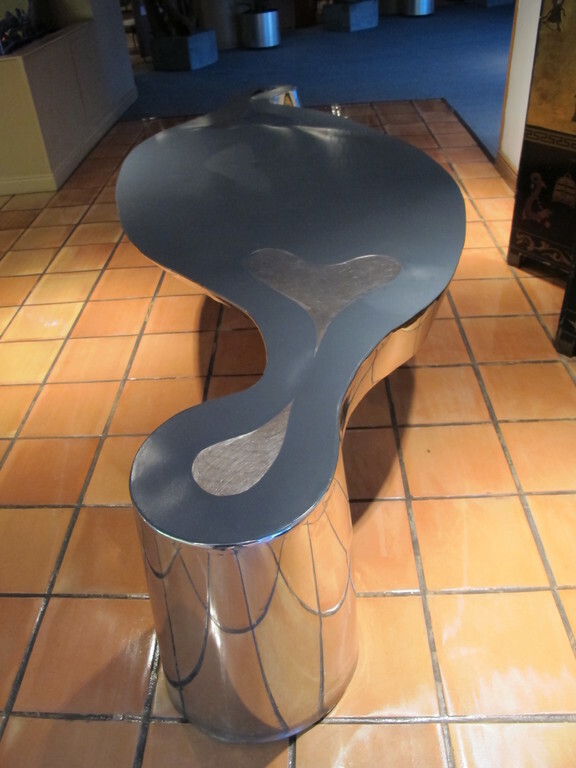 What a funky looking table! This would be fun to have in my dining room. I wonder if there are anymore like it out there? I love modern art! The hearts in the table really work well with it. Kind of make you wonder how they made it......? It's Picassos dinner table ha ha. 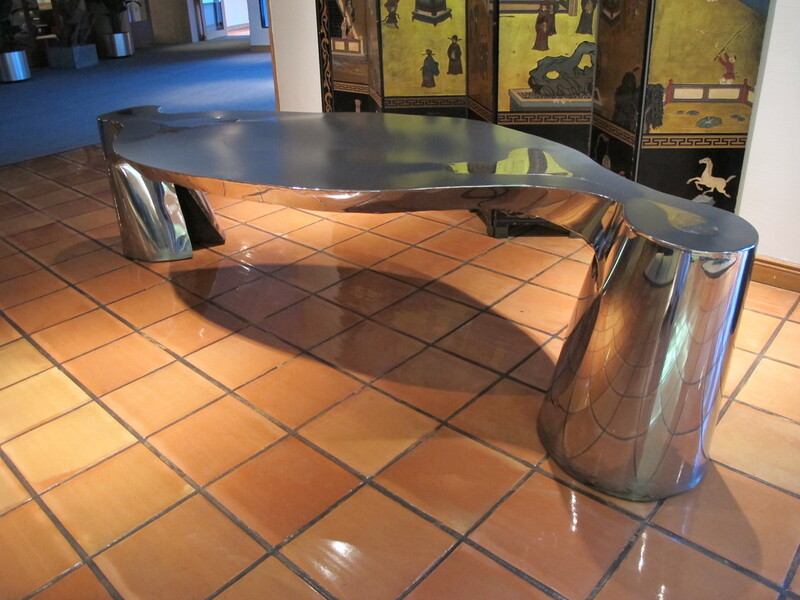 Oooooo I absolutely love this table!!!!!! !